So far, 2015 has already been a great year for the tiger, one of the world's most charismatic and critically endangered species. In January, India - estimated to be home for around 70 percent of the world's wild tigers - announced a 30 percent increase in its tiger population over the last five years. It seems that the country's efforts to streamline its conservation efforts are now starting to pay dividends. As someone who has been extremely privileged to hear a wild tiger's roar echo through an Indian forest, I (like many others) hope that this is just the beginning of a full recovery for this enigmatic species. As we enter February, there is even more good news to celebrate, this time for captive tigers. Thai authorities recently confirmed that they have impounded more than 100 tigers at the infamous 'Tiger Temple' in Thailand's western Kanchanaburi province. This controversial tourist attraction has been linked to reports of animal cruelty and engagement in illegal wildlife trade activity, repeatedly over the last ten years. In fact, it has been in the spot light ever since I first started working on wildlife issues. Yet it was only late last year that I had the opportunity to visit and observe a tiger park in Chiang Mai myself. Knowing their reputation, I sat rather uncomfortably on the balcony of the tiger park's restaurant and was truly astounded by what I saw. Weighing in at up to 400 pounds, tigers (irrespective of whether they are in captivity or in the wild) are highly evolved carnivores that deserve a more than a certain measure of respect. However, this concept seemed to have totally escaped the visiting tourists who were cuddling adult tigers (with three inch canines fully intact) right before my eyes. To say that I was unsurprised to hear that a tourist visiting a tiger park in Phuket was mauled (thankfully in this case not fatally) the very next day is an understatement. I would advise anyone visiting Thailand to immediately remove this from their to-do list. 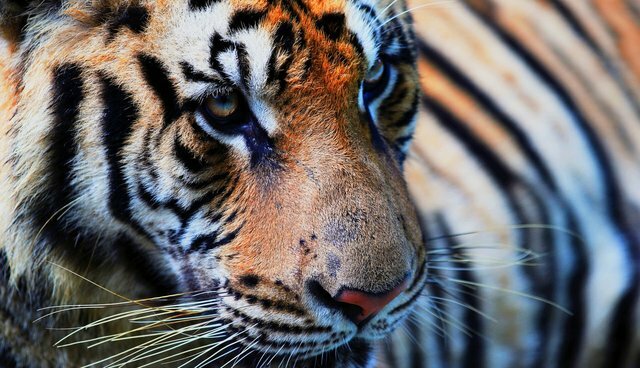 Finally, good news comes from the United States, where New York State's new law now bans such direct interaction between people and big cats (including tigers) takes effect this month. "Tiger selfies" are reported to be an emerging international phenomenon (particularly for singletons keen to spice up their online dating profiles). In New York alone, over the last 15 years there have been at least seven known incidents of tigers escaping or hurting people at a public show. Significantly, the bill bans taking photos of people and such animals without a permanent physical barrier between them. It is hoped that this measure will to prevent any other similar attacks from ever happening in the future. Of course, all of these developments are great news for tigers too. On initial glance, 'tiger selfies' may seem harmless, but it is being increasingly recognized that these 'once-in-a-lifetime' snaps can actually represent a lifetime of suffering for the individual animals involved. Banning 'tiger selfies' will help to prevent captive-born cubs being taken away from their mothers when they are just several weeks old, the removal of their claws and the use of harsh training just in order to keep them under control. It will also stop tigers from being kept in crowded confined cages both in and out of public view when they are not on display. I would advise any who cares about tigers to go see (and Instagram) them in the wild where they belong. Tigers have had a very bright start in 2015. I have my fingers crossed that it will continue to prove a pivotal year for the protection and preservation of this critically endangered species.